I learned a new word this week: ‘Aho’. Aho is an ancient Lakota word that, roughly translated means, “I hear you”. You might compare it to the familiar ‘amen’ often uttered in a church service. 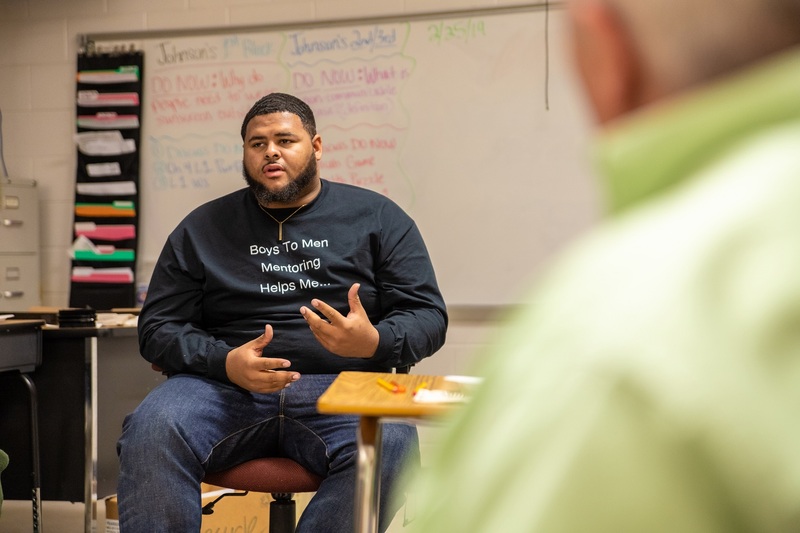 However, its meaning is particularly significant among the youth in the Boys to Men mentoring program in Prince George County. To them, it’s an affirmation that someone is there for them; to listen, to care, and to understand. Robert Lucas is an MIT – a Mentor in Training. These are young men who have stayed in the program after they graduate (ages 18-23). Many of the young men involved in the program come from adverse backgrounds. Some are missing a parent. Some come from poverty. Others are missing family support systems entirely. Some have already had brushes with the law. Enter Steve Martin and Johnné Glover. Boys to Men Mentoring Network was founded in 1996 in San Diego, California. But, Steve and his team have been running the chapter out of Richmond, Virginia since 2009. Now the Richmond chapter serves fifteen schools in the region with plans to expand in the coming year. The boys in the program range in age from 12-17 and come from diverse backgrounds and circumstances. They come to the program seeking shelter from these things and to learn its core tenants; listen, accept, encourage, and support. And, some have been coming for years. Left to right: Mentor, Johnné Glover, honors Robert as MIT Oz Willet looks on; Meetings are called “Circles” – you can see why; Program Director / Mentor, Steve Martin. On the Tuesday I visited the group at NB Clements Junior High, I found Steve and Johnné with the guys eating pizza, their desks arranged in a circle. Every meeting starts with a “check in”, where Steve individually asks each young man, “What’s going on with you?” Four years prior, some of these boys wouldn’t have been able to answer that question in front of other people, much less a visitor they’d never met before. Yet, one participant, let’s call him James, looks around the room, making eye contact with everyone and tells them how he’s feeling today. He talks about his situation at home and emphasizes what his mother calls “noticeable improvement”. I listen intently as each young man around the room shares his feelings with the group, good or bad. What strikes me most about these young men is their maturity. Each speaks his mind and the others respectfully listen. They have been learning responsibility. One young man proudly tells us that he is about to pay off fines incurred after a DUI. Another rejoices in rising grades. Another is happy about holding a job and working hard. 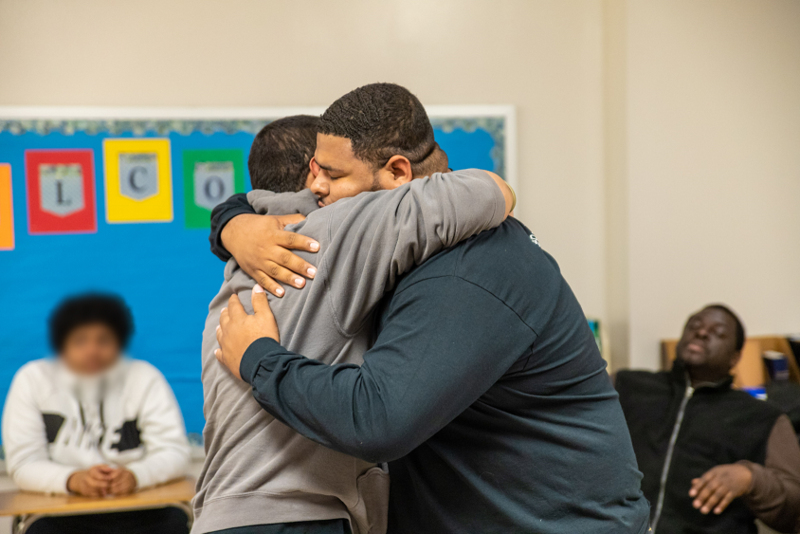 From the classroom to the home and the workplace, these young men are learning to be responsible adults. That means admitting mistakes, being honest with each other, and, perhaps the most difficult, being vulnerable without feeling shame. One of my favorite parts of the meeting was when one young man chose to “honor” another. This takes place when someone wants to deliver positive encouragement to another face to face. Two approach the center of the circle with a third standing to the side for support. Looking each other in the eye, one expresses how proud he is of the other in some personal triumph. They encourage deliberately and specifically. Respect is key here. One asks the other if it’s OK to go in for a hug. Both consenting, they enjoy a monstrous bear hug, hands thundering against each other’s backs. Steve asks the group about one of the young men, “Did he like to talk like that four years ago?” The room answers back with a loud “No!” His stutter is gone now. Steve asks another young man sitting in the circle, “What did you see there?” “Men being men”, he replies. Watching these young men, having often overcome immense adversity and deep trauma, standing tall and acting with dignity is truly heartwarming. These boys are learning to be men in the truest sense of the word; with honor, respect, honesty, empathy, patience, and strength. In closing the meeting, it’s customary for everyone to “check out” and offer their final thoughts. The youngest in the room offers a final observation; “I feel like we are brothers in here.” And with that, as they say at the end of the meeting, “I’m out”. Photography and story by Daniel Jones Foto.